In the spirit of all things summer, I wanted to share one of my favorite refreshing recipes. 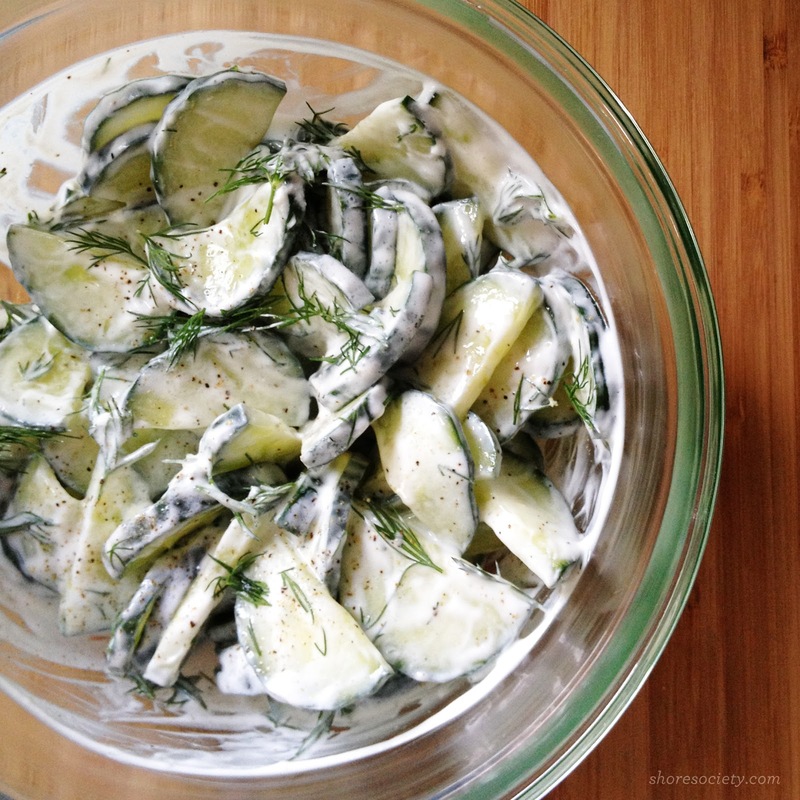 This is a perfect side dish for grilling – the dill pairs especially well with a good salmon burger or barbecue chicken. I am also obsessed with dill pickles, so this salad is an easy favorite (although it doesn't taste exactly like a pickle – it's better)! 1) Cut and slice your cucumber, and place slices in a colander. You're going to sweat the moisture out of the cucumbers before you put the salad together. Sprinkle kosher salt over the dukes (be generous) and let the colander sit where it can drain (in the sink, for example) for 30-40 minutes. Give them a good shake about halfway through to redistribute the salt. 2) Rinse the salt off the cukes, remove from colander and lay out on paper towels. Pat them dry, then transfer to a large bowl. 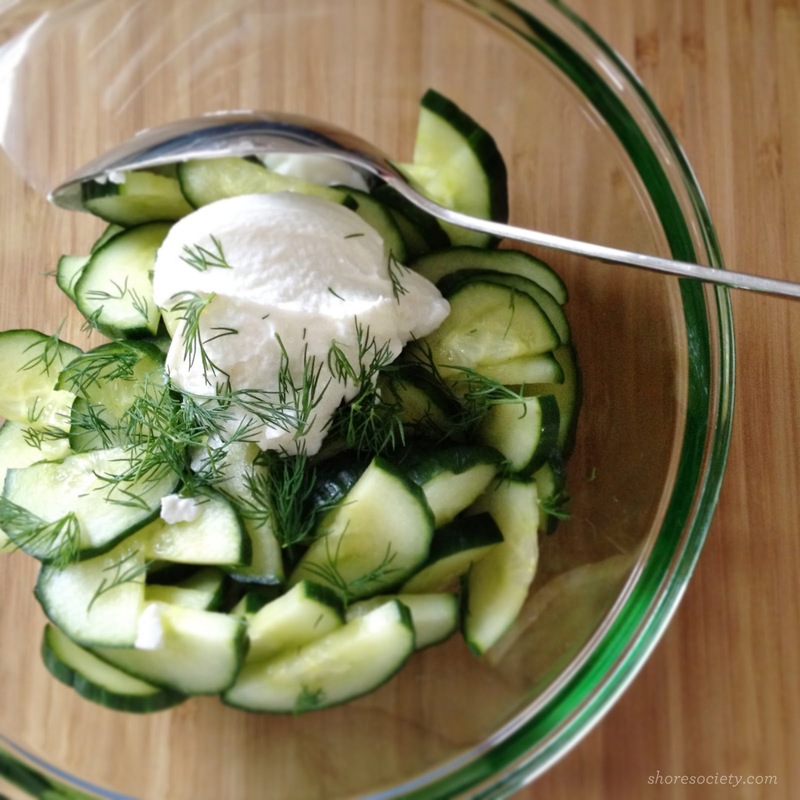 3) Add in the yogurt (start with a small amount, depending on how creamy you want it) and the dill. Stir to combine. Juice the lemon half into a separate bowl, remove the seeds, then add the juice a little at a time to the salad. Depending on how much moisture your cucumbers contain, you don't want to add too much lemon juice and have the salad get watery. Season with salt and pepper, and you're good to go! Keep refrigerated until serving. I typically don't make this too far in advance to prevent the yogurt and lemon mixture from breaking down, but it can sit nicely in the fridge for an hour or so, allowing the flavors to meld. Aren't summer salads the best? I'd love to hear some of your favorites! Oh my gosh, this looks amazing. Oh, it is. I devour it!